↱ Kenwood TM-431A combines high performance receiver and transmitter specifications with easy-to-use features. There are 20 multi-function memory channels plus 1 call channel, and all can be used to store transmit and receive frequencies as well as repeater and signaling data. ↳ The TM-431A transmits on 2 meters with three output power levels: 5/10/50 watts. Extended receiver allows reception from 138 to 174 MHz. You also get auto-power off, built-in CTCSS encode, time-out timer, auto repeater offset and easy to read LCD. Frequency steps are: 5, 10, 15, 20, 12.5, and 25 kHz. The Kenwood TM-331A transmits on 220 MHz with three output power levels: 5/10/25 watts. The Kenwood TM-431A transmits on 440 MHz with three output power levels: 5/10/35 watts. 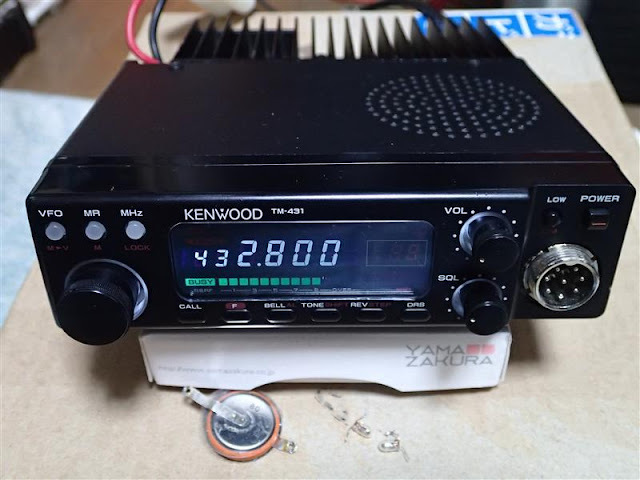 The Kenwood TM-531A transmits on 1200 MHz with 1/10 watts. The TM-531A features ALT - Automatic Lock Tuning to compensate for frequency drift. MB-201 Purchase this under-dash mount for a second vehicle.